300 Total square inch cooking surface. Firebox size: 20”L x 15"D x 10"H.
Grill rotates a full 360 degrees. Cooking grate has cool-coil handles and can be adjusted to four different levels. All MIG welded 7 ga. base plate with 10 ga. side plate. Galvanized iron pipe post, inground mount. Durable rust-resistant high-temp black powder coated firebox. 2 3/8" and 3 1/2" posts available. Optional hot-dip galvanized firebox and utility shelf. 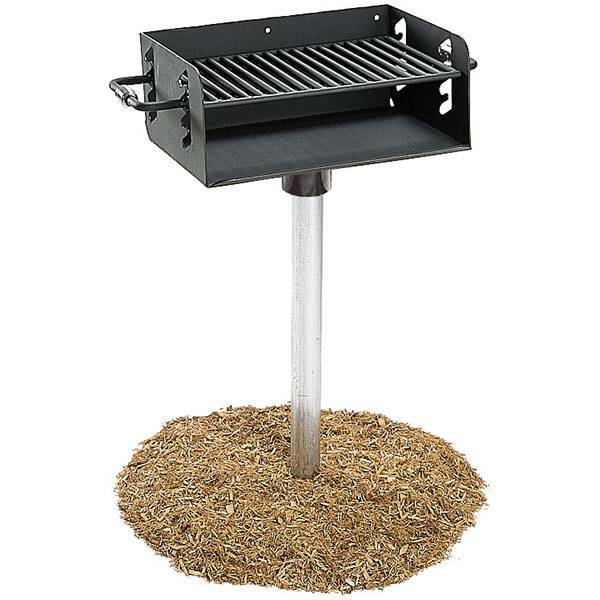 Enjoy your outdoor grilling with our Adjustable Rotating Grill, 300 Sq. Inch - Inground Mount. The 630 rotating park grill rotates a full 360 degrees. This adjustable grill has 280 square inches of cooking area with a 4-level adjustable cooking grate and cool-coil handles. Available with 2 3/8" and 3 1/2" inground mounted posts and utility shelf.